You can get your feed from her!!! We were not happy with the way the pigs looked on the commercial pig feeds, which were NOT designed with Micro Mini Pigs in mind, so over time and with experimenting different recipes on our own 7 Micro Mini Pigs, we have developed our own nutritionally balanced feed and now have it available to sell. It has been nutritionally analyzed by a professional laboratory. It comes in approximately 2 months’ worth packages (lasts longer for piglets), which we ship right to your door. 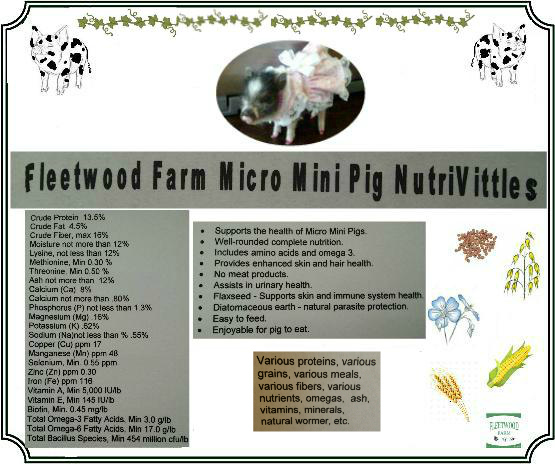 We have tested it on our own Micro Mini Pigs and are extremely happy with the results. It supplies all needed nutrients along with added bonuses! Additional vitamin E and selenium added. Packaged in double-lined bags and boxed to assure and maintain quality.